One of the great architectural treasures of Cornwall, Trerice Manor lies secluded and hidden off the beaten track, three miles south-east of Newquay, approached by winding lanes little used even in the height of the summer holiday season. This is Trerice, Cornwall’s finest Elizabethan house, an example of the type of upper-class property built during the prosperous years of the late 16th Century. Trerice incorporates ‘foreign’ ideas that were fashionable then and within reach of the wealthy. In this respect it can be compared with Ince Castle and Mount Edgcumbe, both of the same period and both, also, strangers in a Cornish landscape. Nevertheless, Trerice is a fine house in its own right, with gold-lichened walls covered in ivy and a grey slate roof, set amidst ancient elm trees and green lawns, in a tiny valley whose stream runs down to the Gannel estuary near Newquay. 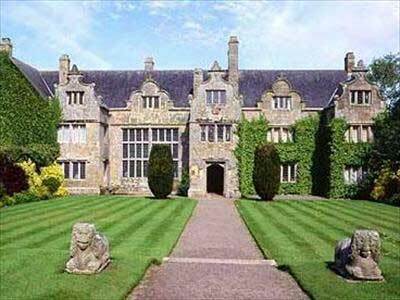 For many years Trerice was an estate of one of Cornwall’s most ancient and illustrious families, the Arundells, becoming a possession by marriage during the 14th Century. The original manor house was felt adequate until the late 16th Century, by which time the family, then very wealthy and well connected, aspired to a property more worthy of their position. Sir John Arundell, the Sheriff of Cornwall, undertook construction of the new manor house. The immediate approach to Trerice is nevertheless modest in comparison to many of Cornwall’s great houses. A simple wrought iron gate opens off a country lane straight into a relatively small front garden, formerly a walled and cobbled courtyard, but now laid down to a formal lawn setting with yew trees. Above this, on the north side, lies the long, narrow bowling green. While on the other, south side of the house is an orchard, the fruit trees of which have been laid out in the accepted Elizabethan pattern. Behind the mansion is situated the barn and other buildings of the 16th Century manor farm, set around a large courtyard enhanced with two circular raised lawns and home to a number of peacocks. Regrettably very little else remains of the original 1,500 acre estate, which was sold off after its purchase by Cornwall County Council in 1915, so it is for the interest of the Elizabethan house alone that Trerice is known. Excepting the plain east gable of the south wing, the façade of the house, with its two-storey porch in the centre and slightly projecting wings, is beautifully symmetrical. Two features are outstanding, the unusual scrollwork gables, an architectural embellishment quite new to Cornwall, and the imposing 24 light windows. This window with 576 panes illuminates the Great Hall of the house. Before there were small slit openings dating back to mediaeval times, this was a considerable innovation and improvement in its day. Within the house however, the large hall, which was restored in 1844, is conservative in design. It is entered from a passage from the front to the back of the house and is two storeys in height with an elaborate plaster ceiling with ribs and globular pendants. This room has a 20-foot refectory table, built within the room and too large to remove and a fine 16th Century fireplace, there is also a musicians’ gallery above the screens passage. This gallery is accessible from the west corridor which links the north and south wings of the house. Lastly, on the south front is a two-storey semi circular bay dating from the 16th Century. It lights the spacious Solar of the house on the first floor, a sitting room that overlooks the sunny south lawn as well as the geometrical setting of the orchard. The Solar itself has a beautiful barrel plaster ceiling, which, rather like the less elaborate one in the hall, is possibly the work of an Italian craftsman. Beneath the Solar, and sharing the same sunny view is the library. In 1969 this room, which had unwisely been divided into two smaller ones, was restored to its former grandeur. The furnishings here, like elsewhere in the house (excepting the large table in the hall) have all been acquired from other properties because when Trerice was purchased by the National Trust it was unfurnished.